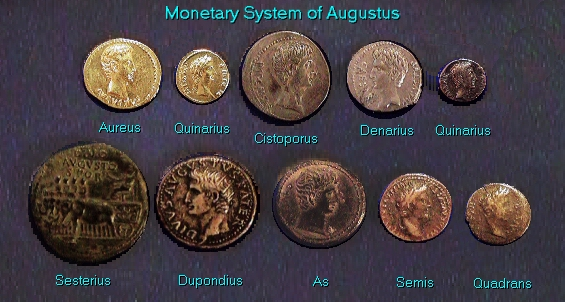 Following the death of Julius Caesar and the conclusion of the final civil war of the period, the emergence of a major monetary reform under Augustus changed forever the monetary system of Rome. It is with Augustus that we find a complete revision of the monetary system of Rome where bronze coinage was at last reintroduced. Augustus retained exclusive control of the minting process of gold and silver while the bronze coinage came under the authority of the Senate in 23 BC. These Senatorial bronze issues were hallmarked with the letters S.C. (“Senatus Consulto”) confirming the Senate’s authority. At first, these bronze issues bare the names of the responsible moneyers as part of the legends prior to 4 BC. Prior to the Augustian reform, Gold was never a regular part of the Roman monetary system. Its appearance tends to be concentrated during periods of war. Therefore, it is with Augustus that gold became a regular issue. The dupondius and as were similar in size yet were distinguishable by the colour of the metals (yellow orichalcum, red copper). At several Asiatic mints Augustus continued to strike the large silver pieces, equal to three denarti, which are usually termed cistophori or tetradrachms. Coins of this size and value had been the primary coinage of Asia Minor from the 2nd century BC. Therefore, the expanded Roman Empire sought to maintain the acceptable old Greek standards of money by producing these larger silver denominations but in accordance with the general style of Roman sometimes with Latin legends but also in Greek. The emperor Nero took considerable interest in the Imperial coinage. The dupondius of Nero was further distinguished by the radiate crown worn by the emperor which became a distinctive feature within the Roman monetary system. This radiate crown was eventually adopted by Caracalla to create double gold and silver denominations. Nero also instituted the quadrans struck in orichaleum in addition to those earlier pieces struck in Copper. It appears that Nero, who was artistically inclined, may have had an ultimate goal of creating a much more attractive coinage series by discarding copper in favour of the brass appearance of orichalcum. Nevertheless, while the radiated crown survived as a means of marking double values, Nero’s experimentation with various metals did not survive his own reign. There were a few small exceptions such as the orichalcum asses struck by Trajan and Hadrian. The sestertius, similar in size to the European crown or US silver dollars, ultimately became a standard monetary unit, which survived until the late 3rd century AD. However, we also find that many legal contracts were expressed in terms of sesterii. The monetary reform of Nero also involved the reduction in weight of the gold and silver coinage. Nero also reduced the fineness of the silver denarius in an attempt to increase the money supply, thereby refecting the inflationary pressures. The silver denarius of the late Republic up to 64 AD was struck for the most part with an average finess of 98%. The pre-reform period did see a slight reduction in weight of the denarius dropping from 4 grams to 3.5 grams by the time Nero came to the throne. However, the monetary reform of Nero in 64 BC saw fit to reduce the silver denarius to 93.5% fineness with an average weight of 3.36 grams. With the outbreak of Civil War following the death of Nero, the silver weight of the silver denarius was further reduced. The weight fell to 2.93 grams on average while the fineness remaining in the 94% range. We do see some pieces struck with a fineness at times droping below 90%. The victor to rise from this Civil War was Vespasian. Here we find that the average silver content between 69-71 AD clearly stood at 90%. Vespasian attempted to restore the silver content by raising it to 92.5% on average in 72 AD. This demonstrates that there was at least some public concern over the debasement of the silver coinage, which had prevailed during the Civil War of 68-69 AD. Vespasian’s attempt at restoring the silver content of the denarius was short-lived. His youngest son, Domitian lowered the silver content once again upon coming to the throne in 81 AD. Between 81-82 AD, the silver content appears to have decline to 91.5%. Domitain then raised the silver content to 97.9% during 82-85 AD restoring the denarius to nearly Republican standards. However, the inflationary pressures of the period made this effort unsustainable as the silver content dropped once again to remain at 93.5% between 85-96 AD. The silver content of the denarius was slightly reduced again to 93.25% when Nerva came to the throne in 96 AD. Trajan appears to have maintained the silver content of the denarius at an average of 93.5% during the period of 98-100AD. No doubt, the Dacian wars prompted a further reduction in fineness to 92.75% between 101-102 AD, 91.5% in 103-111 AD and a final decline back to Civil War levels of 90% between 112-117 AD. Hadrian carried out his own continuation of the debasement trend in Roman silver coinage as the fineness fell to 88.5% between 117-118 AD. Still, Hadrian’s reforms, which included taxation, also sought to raise the silver content once again in 119 AD back to 90% where it remained until 128 AD when it rose slightly to 90.5%. Antoninianus Pius, Hadrian’s successor, reduced the fineness once again to 88.5% upon rising to the throne in 138 AD. It would appear, that as a new emperor came to power, monetary gifts were necessary to insure or “buy” loyality. As a result, during the 2nd century AD, we seem to find a pattern of almost immediate debasement during the early years of a new emperor. In 140 AD, Antoninianus Pius raised the silver fineness slightly to 88.75% and again in 148 AD to 89%. However, financial pressures once again appeared and the fineness of the silver denarius dropped sharply to a new low of 83.25% in 150 AD. Again, there was an attempt to restore the silver content when it was raised back to 86.5% in 158 AD. When Marcus Aurelius came to power in 161 AD, once again we see an almost immediate reduction in the silver content to a new historical low at 77.5% between 161 and 165 AD. Aurelius raised the silver content back to 80% in 165 AD, but by 170 AD it fell once again back to 78% rising slightly to 78.5% in 175 AD. Upon the death of Marcus Aurelius and the rise to power of his son Commodus in 180 AD, we once again see an immediate decline in silver content to 75%. Commodus, however, made no attempt to restore the fineness of the silver coiange following his early years. In fact, a further reduction in the fineness of the denarius took place in 184 with a modest decline to 74.5%. By 188 AD, the silver fineness declined further to 73%. In addition to a steady reduction in silver content, Commodus also reduced the weight standard. Between 180-186 AD, the weight of the denarius decline to 3.16 grams while between 187-192 AD, the weight was reduced to 2.86 grams. Following the assassination of Commodus in 192 AD and the outbreak of another Civil War, both the silver content and the weight of the denarius declined. Didius Julianus, who made the highest bid for the throne at the auction held by the Praetorian Guards, was unable to come up with the cash to pay the troops due to the fact that the treasury had been depleted far more than he had expected by Commodus. The weights of even the bronze coinage declined by at least 10% while the gold coinage declined by some 5%+. The conclusion of the Civil War of 193-194 AD resulted in the rise of Septimus Severus to the throne of Rome. As was the case with Vespasian, Severus attempted to restore order by initially raising the monetary standards. The fineness of the silver denarius was raised to 79% in an attempt to reinstitute pre-Commodus coinage. This attempt to restore confidence was yet another brief hining moment in the monetary history of Rome. By mid 194 AD, the inflationary pressues became emence during the final decade of the 2nd century. The silver content declined sharply to 60.5% in 194 AD with a further reduction to 56.5% in 196 AD. The coinage record illustrates that this final decade resulted in what would be clearly termed as the Financial Panic of 194 AD. 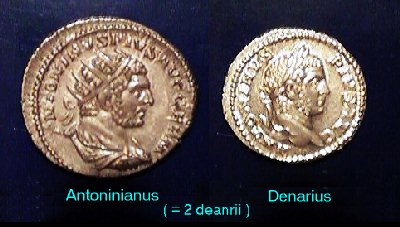 Here we see that within a 2 year period, the silver content of the denarius collapsed by 28% implying that inflation must have been much greater. The Roman monetary system and economy appears to have survived the financial panics of this final decade of the 2nd century. The silver content declined only slightly to 55% in 202 AD where it remained until 209 AD when it rose briefly back to 55.75%. With the death of Septimus Severus and the succession of his two sons Caracalla and Geta in 211 AD, we once again see the financial pressues of a change in government. The silver content of the denarius was lowered from 55.75% to 54.75%. The following year, 212 AD when Geta was murdered by his brother Caracalla, the silver content was reduced again to 50.5%. This near 10% reduction in silver content conincided with Caracalla’s purge of Geta and all his supporters leaving once again a financial need to firm up his support. After this crisis, Caracalla did raise the silver content slightly back to 51.25% in 215 AD shortly before his murder in 217 AD. The monetary reform of Caracalla also included the issuance of two new denominations – the double denarius and double aureus This new silver denomination became known as the antoninianus named after Caracalla’s official name, Antoninus. Both the gold and silver double denominations were distinguished by the portrait of the emperor wearing a radiated crown. This was the same method of distinction between thedupondius and as originally introduced by Nero. The weight, however, was NOT double but on average only 50% greater in both cases. Clearly, the inflationary pressures during the reigh of Caracalla were significant. Pingback: Samsung Announces Gear Live Android Wear SmartWatch!